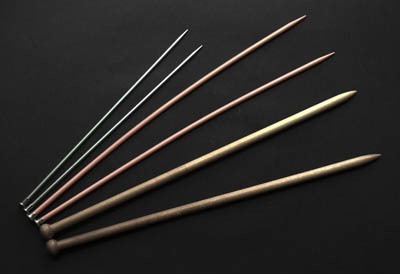 There are different kinds of knitting needles to choose from for different projects. You will find wooden, plastic or aluminum in different lengths and shapes. There are straight, circular or double pointed. 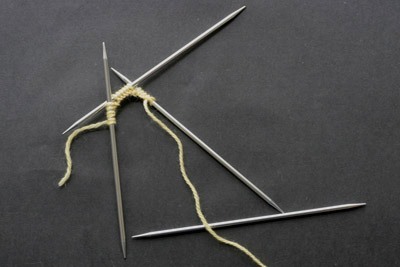 For the most part Knitting Needles are made of wood, aluminum or plastic. They used to make them from bone. If you ever find any bone needles hang on to them as they are very rare and quite valuable. For most projects you will use a standard STRAIGHT NEEDLE. They are sold in pairs and have a point at one end and a knob at the other. 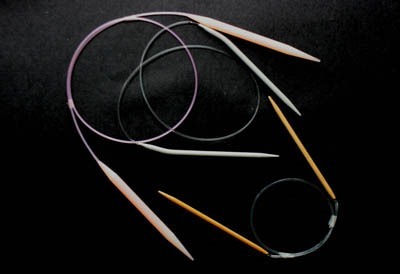 Circular needles have a point at both ends and a cord or wire in the middle. A CIRCULAR NEEDLE is usually used for round projects where you don't want to have a seam, like hats. They can also be used as straight needles for very large projects like afghans. Always wipe your needles off before using them to make sure there are no dirty spots on your work.